I had no clue of who Tulsi Gabbard was before reading the news clip that she had introduced a resolution to protect religious minorities in Bangladesh on July 29. Her first name sounded so familiar: Indian and Hindu! With a Google search, I soon found out that she is an elected Democratic Representative from the state of Hawaii. She is an Iraq War veteran. She is also a Vice-Chair of the Democratic National Committee. Elected in 2012, she is the first American Samoan and the first Hindu member of the United States Congress. Her bio says that she is of mixed cultural and religious heritage. Her father, a Catholic priest, is of Samoan-European descent while her mother, a practicing Hindu, is of European-American descent. As a teenager, she chose Hinduism as her religion. She is also a strict vegetarian. Wikipedia says that the 34-year old Tulsi Gabbard is twice married. After her divorce from the first husband Eduardo Tamayo in 2006, she accepted the marriage proposal of Abraham Williams in February 2015 and they married on April 9, 2015 in a Vedic-style wedding. Interestingly, Tulsi is a member of ISKCON (International Society for Krishna Consciousness), also known as the Hare Krishna movement. She especially appreciates the Bhagavad Gita as a spiritual guide, and used the Gita when she was ceremonially sworn in as a Representative. Gabbard describes herself as a "karma yogi". It is worth noting that ISKCON is a fundamentalist Hindu group that was created by Swami Prabhupada. Hare Rama Hare Krishna a.k.a. ISKCON followers at one time would be seen in various parks and airports distributing Swami's books and collecting donations in return. Many of these ISKCON 'beggars' or more correctly, devotees were very serious about their particular understanding of Hinduism, which they called Krishna Consciousness, learned through meditation, singing and dancing combined with begging. During Swami's earthly life, many white Americans were attracted to his philosophy and left everything to flock behind him as it happens with religious cults. They lived a commune life around the temple with Swami's idol in the front. During my university days in the 1980s I had the opportunity of visiting one such temple in Pico Blvd. in Culver City, near Los Angeles. The community had bought several stores and homes in the neighborhood of the temple. Sari-clad women and shaved-head but pony-tailed men would be seen dancing and singing in the temple. I was told that sexual intercourses between members (married and unmarried alike), and they were too many such incidents, however, became a serious challenge for the commune to live a pure life. Disgusted, many members have since left the group. Although these days we don't see too many of such ISKCON members in public gatherings or busy places 'begging' for money, the group still exists and now seems to have a member of their own - a very powerful voice, which I must add - represented within the US Congress under Tulsi Gabbard. She is a member of the powerful Foreign Relations Committee, esp. its Subcommittee on Asia and the Pacific. She is also a member of Committee on Armed Services and Committee on Homeland Security. Religion is a personal thing and I don't have any issue with one's choice or preference in such personal matters. I am, however, against exploitation of those values for political gains or creating a world of hostility, hatred and intolerance in our planet. That is where, I see serious problems with Tulsi Gabbard's positions! Although a Democrat, she is sounding more like a hawkish war-monger who is sold to the Zionist, Likudnik cause. Take for instance, the case of recently announced nuclear peace deal with Iran. As we remember Nagasaki and Hiroshima this month, 70 years after those two cities were pulverized by atom bombs dropped by the USA, no one should ever belittle the horror of a nuclear war or its capacity to wreak havoc on any civilization. After months of painstaking negotiations, President Obama's administration and fellow members of the P5+1 nations have lately been able to reach an agreement with Iran that is considered to be a fair one by most experts. It would limit Iran's nuclear capability to peaceful means only, which have always been Iranian government's intention for many years. But then, Israeli Prime Minister Netanyahu is unhappy with the deal. As expected, so are AIPAC - the 'all-powerful', pro-Israeli political lobby - and members of the 'Amen Corner' comprising of elected reps from both the major US political parties inside the Capitol Hill, whose loyalty has been more to the State of Israel than to the USA. The Christian Right, esp. CUFI (Christians United For Israel), which is more hawkish than many Zionists, is also upset with the peace deal. Likewise, the war-mongers, mostly affiliated with the military industrial complex ('Armageddon Industry' wing or chapter), are not happy with the peace treaty and are clamoring for a war, insisting that it did not go far enough to cripple Iran's ability to make the 'bomb.' They want war with Iran. Pure and simple! [Forgotten there again are the mere facts that Islam considers the use of nuclear bomb as 'haram' or forbidden, as voiced by many religious scholars inside and outside Iran.] Sadly, Gabbard is also bolstering the anti-peace position. She is proving to be a darling amongst the pro-Israeli groups, CNN and Fox News. In recent weeks, AIPAC has been flooding the airwaves with anti-peace ads with absurd claims how the peace deal once ratified would be a mortal blow to 'little' Israel, which, by the way, is the fourth strongest military power in our world. In an all too familiar and obvious way, the members of the 'Amen Corner' are unfailingly parroting their master voice - Netanyahu's talking points against the peace deal. CNN's Israeli implant, Wolf Blitzer is doing his usual servitude for the cause of Israel. Lest we forget, Blitzer started his career in ‘journalism’ working for the 'all powerful' pro-Israel lobby: the American Israel Public Affairs Committee or AIPAC. Before joining CNN, he was the editor of the lobby group's monthly publication or the mouthpiece, the Near East Report. Blitzer then took up a position with the Jerusalem Post after it came under new ownership and moved from being a left-wing, pro-peace publication to an anti-peace Likud, militant Zionist and neo-conservative rag. Blitzer wrote for them before joining CNN as their (Occupied) Jerusalem correspondent. Prior to Blitzer’s CNN hiring, the network had come under strong criticism for its supposedly anti-Israel bias in covering the first Intifada. CNN's Jerusalem Bureau Chief Robert Weiner and correspondent Michael Greenspan were branded as “self-hating Jews” by several American Jewish organizations, led by the Anti-Defamation League of B’nai Brith. Under pressure, CNN fired/replaced its targeted journalists and replaced them with Blitzer, a man with pro-Israel bonafides, in order to appease the Zionist power brokers. Blitzer became the Israeli voice inside CNN. “The hostile journalists of CNN are finally going home,” announced a bold headline in Israel’s daily, Yediot Aharonot, where Blitzer once worked.During the 1980s, Blitzer also wrote for Hadassah magazine, the publication of The Women’s Zionist Organization of America. It is no accident that Wolf Blitzer is unreliable as a journalist. He is biased for Israel when it comes to reporting and analyzing world events. As I have noted many times in the past, 9/11 has made the 'Amen Corner' and the Israeli lobby very powerful. The tragic event was a God-send for them. Many of these extremist members, with moral (if one could call it as such) support coming from the Christian Right, are unambiguously vocal about launching an all-out war ('Armageddon'-style) against Muslim countries. With the entire Middle East now burning with incessant wars, apparently, they are succeeding in their sinister plan. But still they are not satisfied or so it seems unless Iran could be brought to the frying pan. So, the conspiracy goes on to defeat the nuclear peace deal. Tulsi Gabbard is adding her voice against the nuclear peace deal. She is also upset with Turkey's recent decision to go after the ISIS and PKK terrorists. Tulsi Gabbard is also proving to be a bigot. Early this year, she has been all over the media slamming President Obama's refusal - a right decision, which I must add - to directly associate ISIS and other terrorists with the Islamic faith. Appearing with Fox's Neil Cavuto in February, she lashed out at the White House for holding an extremism summit with Muslim Americans, saying it's a “diversion from what our real focus needs to be. And that focus is on that Islamic extremist threat.” She criticized Obama for saying that “poverty, lack of access to jobs, lack of access to education” is contributing to radicalization. “They are not fueled by materialistic motivation, it's actually a theological, this radical Islamic ideology,” she said, throwing red meat to Fox viewers. As noted in an article by Zaid Jilani of the Alternet.org (February 22, 2015), "The case of Tulsi Gabbard becomes less curious and more expected once you look at her links to a different set of ethnic and religious hardliners: the Hindu nationalist Indian Bharatiya Janata Party (BJP). Since her election to Congress, Gabbard has tied herself closely to this party, which has a history of condoning hatred and violence against India's Muslim minority." Many of her stateside donors and supporters are also big supporters of this toxic Hindutvadi movement, which disdains secularism and promotes religious sectarianism. 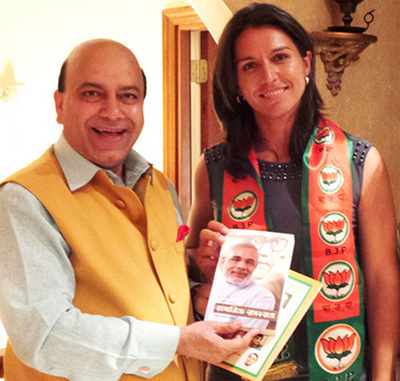 Gabbard idolizes Narendra Modi, who represents what is ugly and wrong with India. A look at her official web pages is enough to validate this fact. She called on Indian Prime Minister Narendra Modi when he was on a visit to New York on September 28, 2014 and presented him with a ginger flower garland from Hawaii. She also gave Modi her own copy of the Hindu Holy Book "Bhagavad Gita" (same copy that she used to take the Oath of Office). Why would a concerned human being idolize a murderer who as the chief minister of the state of Gujarat had scripted anti-Muslim pogroms in 2002 that led to the death of some 2,000 Muslims? [Although Modi was never indicted for those killings and rapes, many including a senior police officer who testified before India's Supreme Court said Modi believed his region's Hindus should be allowed to “vent their anger,” and deliberately allowed the rioting to happen for some time before intervening.] Why would any decent human being be fond of a fascist organization like the BJP, which has been a very divisive force inside India challenging its secular fabric? Gabbard speaks of protecting the rights of minorities inside Bangladesh, as if those rights are threatened. It is insulting, to say the least, specially coming from an individual who idolizes Modi and bows down to his fascist philosophy of exclusivism and intolerance. Ms. Gabbard: what about minorities inside Modi's India, who are facing increasing threats to their very identities under Modi's Hindutvadi rule? As a member of the Subcommittee on Asia and the Pacific, she ought to know that after staging the Yoga on June 21, 2015 on Raj Path, Delhi, Modi Sarkar has planned to celebrate Rakhi, Raksha Bandhan at a grand scale in late August. This plan has full approval of its parent organization, the RSS. "Now a Hindu religious festival will be given the status of a national festival so blatantly," Professor Ram Puniyani laments. "It surely is indication of the type of deeper agenda of narrow nationalism this Government has in mind." As a die-hard Hindu fanatic, Gabbard has been in the business of protecting unjust Hindu and Indian interests. Consider, for instance, HR 417, which was introduced in November 2013 by a group of 26 House Democrats and 25 House Republicans. The Resolution called on India to improve the human rights situation of its religious minorities, especially citing the case of Gujarat. The text of the bill was fairly un-offensive; it did not single out Hindus as perpetrators of religious violence, but rather called for all groups in India to be treated fairly and given full human rights. However, Gabbard made it her personal mission to crusade against the bill. In other words, Gabbard's concern was that Modi's electoral chances would be hurt by an honest look at religious persecution in India. Thanks to Gabbard, HR 417 was never voted on, and Modi won his election! The rest is history! Elections data show that BJP backers, many of them affiliated with the U.S. India Political Action Committee (USINPAC), have been donors to her campaign in virtually every part of the country. So when Sreemati Tulsi Das is silent on Hindutvadi agenda in Modi’s India, her shedding of crocodile tears for Hindus living securely (and more prosperously than majority Muslims) inside Bangladesh only bares naked her dismal hypocrisy. Ms. Gabbard: You can't have your cake and eat it (too). Otherwise, you can't escape from being accused of double-standards and protecting intolerant fascist ideology. She sounds like a typical politician.